Indian troops returned fire from the camp in the garrison town of Baramulla, 50km (30 miles) north-west of Srinagar, the main city in Kashmir. 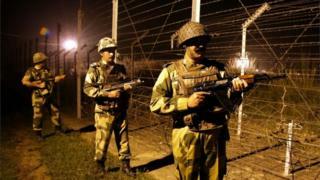 Sunday night's attack came three days after India's army said it had carried out a "surgical strike" in the region. The Indian assault followed the deadliest attack on one of its bases in Kashmir in years. On 18 September, militants entered an army base in the town of Uri and killed 18 soldiers. India accuses Pakistan of arming and training insurgents fighting for Kashmir's independence from India or its merger with Pakistan, a claim Pakistan denies. Disputed Muslim-majority Kashmir has been a flashpoint for decades and has sparked two wars between India and Pakistan, which both control parts of the disputed territory but claim it in full. Relations between India and Pakistan have sharply deteriorated since the attack in Uri earlier this month. Pakistan says India's stance is a "blatant attempt" to deflect attention from human rights abuses in the region. Kashmir attack: What's behind the deadliest militant raid in years?